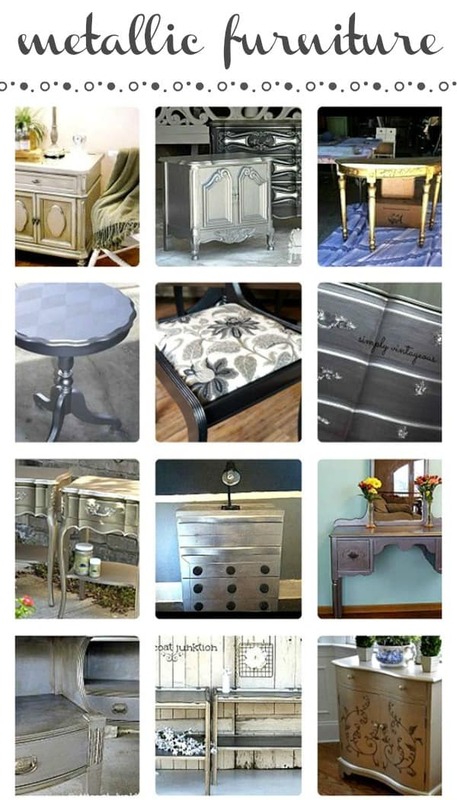 You will love these metallic furniture paint makeovers, I promise. 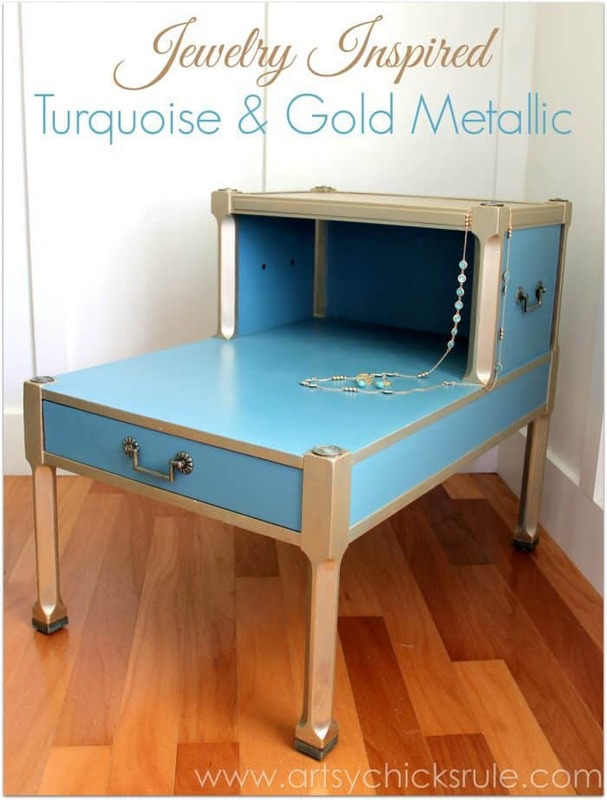 You can never go wrong with metallic furniture. Want a statement piece for your home? Go for metallic. These days there are endless color choices in metallic paint. I’m partial to soft teal blues these days. Gold, silver, zinc, pink…..waxes, paints, glazes….. the metallic finishes and products run the gamut. I think my first metallic paint project is my favorite. My oldest granddaughter who was 8 at the time helped me paint a pair of nightstands. The paint is Martha Stewart Precious Metals and they don’t make that particular paint anymore. I recommend FolkArt Home Decor Chalk Metallics or Modern Masters. Just click any of the pink text links to view the complete project. 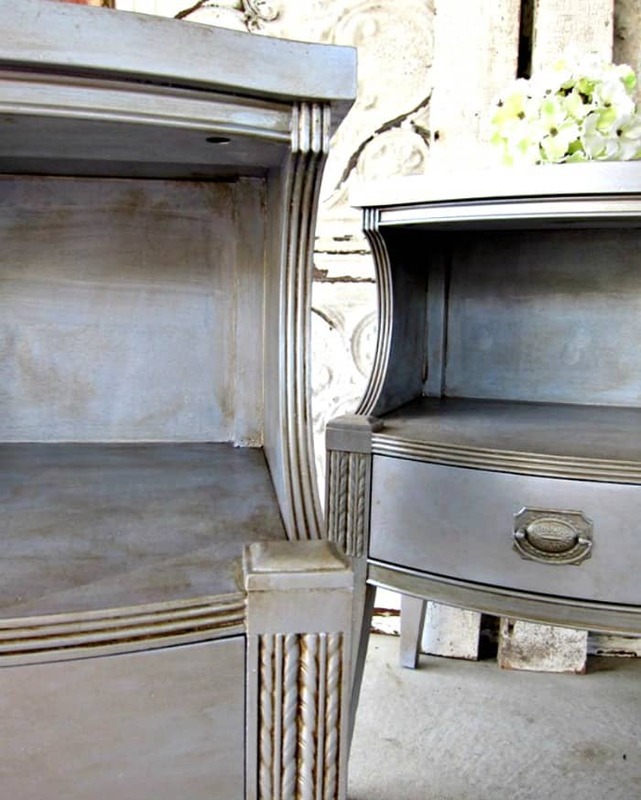 Lori, Vintage Charm Restored, is one of my favorite furniture painters and this pair of nightstands she painted is simply stunning. And Martha of Martha Leone Design always amazes me. I call her an artist, not just a furniture painter. I wish I could think up projects like this one. This two-tone beauty really looks like a high end piece. Nancy, Artsy Chicks Rule, is responsible for this work of art. Mixed Metallics Buffet from yours truly! This post would be 6 pages long if I inserted all the images from the clipboard so I want you guys to click on the large graphic at the top of the post and view all the metallic makeovers….please….it would make my day. I would even do the happy dance. I know you may not have time to check them all out today…but you know where I am. You can always come back here and click the graphic again…and again. Great job Kathy! Thanks for featuring my silver vanity! Love the shimmer shimmer Kathy! Thanks so much for including my dresser. 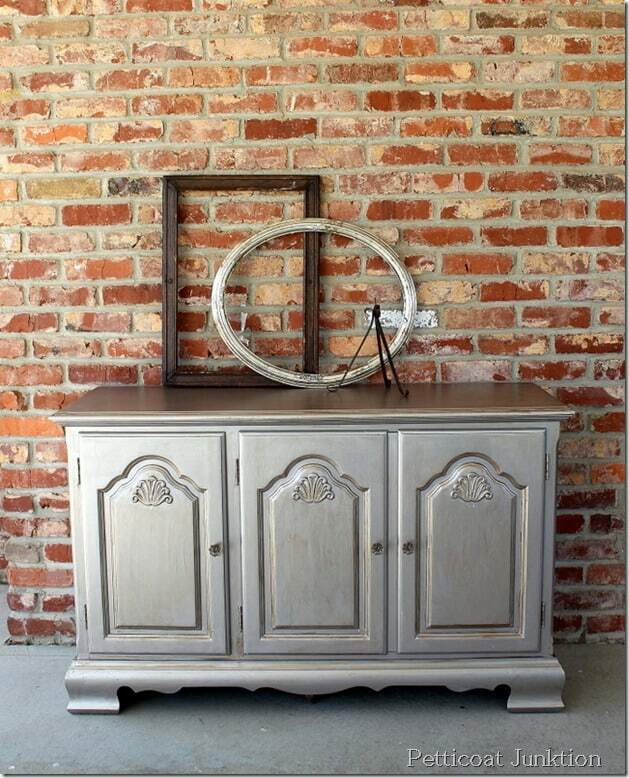 Since doing that piece, I painted a dresser in the same Martha Stewart silver for a customer. With that piece, I learned that using a roller then going over it with a paint brush to eliminate the bubbles works wonderfully and creates a lovely smooth finish with no brush marks. I’ll write a post about it soon but thought i would send that tip your way… I bet ya already knew that though!! Can’t wait to go see your board on Hometalk!